I have a weakness for vegetable cakes and fritters. I’ve always loved a little fried cauliflower when I’m out having a drink but obviously, it’s an occasional treat. However, fritters are a great in-between. The vegetable are still front and center but the light pan fry provides a perfectly crisp outside. I could eat almost any vegetable in fritter form. These kohlrabi fritters are from Andrea’s blog-titled book, Dishing Up the Dirt. If you’ve not checked out Andrea’s site before, it’s a wonderful ode to fresh, produce-driven recipes. She and her husband run a CSA and you can see the influence in her cooking style. Andrea’s book is full of wonderful stories and recipes. While it’s not all vegetarian, you feel inspired no matter. As for these fritters, the balance of kohlrabi and potato is spot on and if you don’t make her cashew cream sauce, you’re missing out. I think I want to spoon it on everything. Also, I made these for my toddler and he ate every last bit of the kohlrabi fitters and the cashew sauce! Read more and see the recipe. 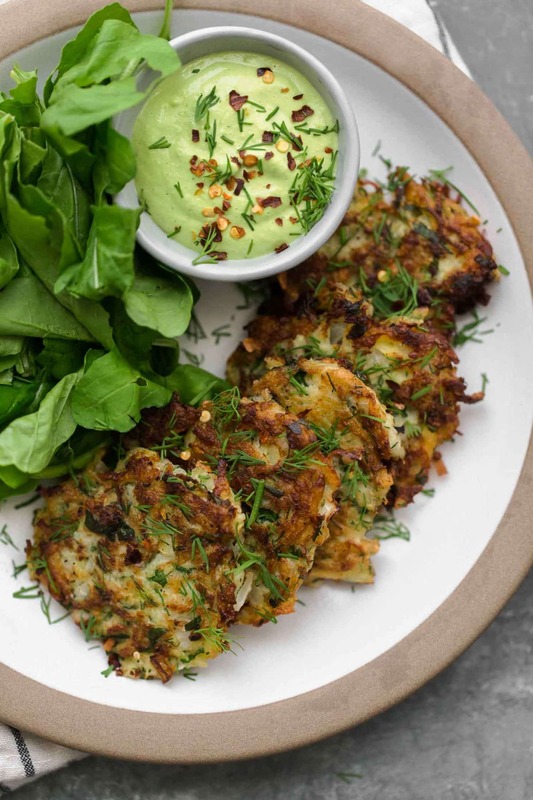 The post Kohlrabi Fritters with Garlic Herb Cashew Cream Sauce appeared first on Naturally Ella.